Domestic geese (Anser anser domesticus or Anser cygnoides domesticus) are domesticated grey geese (either greylag geese or swan geese) that are kept by humans as poultry for their meat, eggs, and down feathers since ancient times. In Europe, northern Africa, and western Asia, the original domesticated geese are derived from the greylag goose (Anser anser). In eastern Asia, the original domesticated geese are derived from the swan goose (Anser cygnoides); these are commonly known as Chinese geese. Both have been widely introduced in more recent times, and modern flocks in both areas (and elsewhere, such as Australia and North America) may consist of either species or hybrids between them. Chinese geese may be readily distinguished from European geese by the large knob at the base of the bill, though hybrids may exhibit every degree of variation between the two species. The domestication, as Charles Darwin remarks (The Variation of Animals and Plants under Domestication i. 287), is of very ancient date; archaeological evidence for domesticated geese in Egypt more than 4,000 years ago. They have been selected for larger size, with domesticated breeds weighing up to 10 kilograms (22 lb), compared to the maximum of 3.5 kilograms (7.7 lb) for the wild swan goose and 4.1 kilograms (9.0 lb) for the wild greylag goose. This affects their body structure; whereas wild geese have a horizontal posture and slim rear end, domesticated geese lay down large fat deposits toward the tail end, giving a fat rear and forcing the bird into a more upright posture. Although their heavy weight affects their ability to fly, most breeds of domestic geese are capable of flight. Geese have also been strongly selected for fecundity, with females laying up to 50 eggs per year, compared to 5–12 eggs for a wild goose. As most domestic geese display little sexual dimorphism, sexing is based primarily on physical characteristics and behaviour. Males are typically taller and larger than females, and have longer necks. In addition, males can be distinguished by the protective behaviour they exhibit towards their mates and their offspring - the male will typically stand between his partner and any perceived threat. Changes to the plumage are variable; many have been selected to lose dark brown tones of the wild bird. The result is an animal marked, or completely covered in white feathers. Others retain plumage close to the natural; some, such as the modern Toulouse goose look almost identical to the greylag in plumage, differing only in structure. White geese are often preferred as they look better plucked and dressed, with any small down feathers remaining being less conspicuous. From the time of the Romans, white geese have been held in great esteem. Geese produce large edible eggs, weighing 120–170 grams (4.2–6.0 oz). They can be used in cooking just like chicken's eggs, though they have proportionally more yolk, and this cooks to a slightly denser consistency. The taste is much the same as that of a chicken egg, but gamier. Like their wild ancestors, domestic geese are very protective of their offspring and other members of the flock. The gander will normally place himself between any perceived threat and his family. Owing to their highly aggressive nature, loud call and sensitivity to unusual movements, geese can contribute towards the security of a property. In late 1950s South Vietnam, the VNAF used flocks of geese to guard their parked aircraft at night due to the noise they would make at intruders. Because domestic geese descended from the Greylag goose are effectively the same species as their wild ancestor (being a subspecies formed through domestication), escaped individuals readily breed with wild populations, resulting in the offspring sometimes resembling either one of their parents, or bearing mixed plumage with patterns of grey and white feathers. When Aphrodite first came ashore she was welcomed by the Charites (Roman "Graces"), whose chariot was drawn by geese. There are Mother Goose tales, such as a farmwife might have told; there is the proverbial goose that laid the golden eggs, warning about the perils of greed. The geese in the temple of Juno on the Capitoline Hill were said by Livy to have saved Rome from the Gauls around 390 BC when they were disturbed in a night attack. The story may be an attempt to explain the origin of the sacred flock of geese at Rome. Liliane Bodson and Daniel Marcolungo, L'oie de bon aloi: Aspects de l'histoire ancienne de l'oie domestique [The goose in ancient life and folklore]. Vise (Musée Regional d'Archeologie et d'Histoire de Vise), 1994, discusses the image and lore of domestic geese in classical antiquity, with a separate chapter on the goose in folklore. Angel Wing - A disease common in geese. ^ a b c d Hugo, S. (undated). Geese: the underestimated species. FAO Agriculture Department. ^ "Geese, the unbridable watchdog". Food and Agriculture Organization of the United Nations. 16 August 2014. Retrieved 16 August 2014. ^ Cocker, Mark; Mabey, Richard (2005). Birds Britannica. Chatto & Windus. pp. 74–76. ISBN 978-0-7011-6907-7. 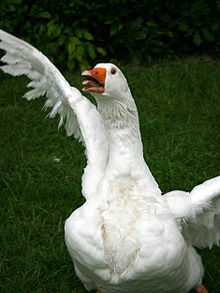 Wikimedia Commons has media related to Domesticated geese.